The impact of the recession on New York City has been clear: empty storefronts, disheartening newspaper headlines, advertisements for “recession buster” sales, and lines at job fairs that embrace entire blocks. Yet during these leaner times, there is also a continuation of the vitality of New York’s identity as one of America’s primary terrains for the production and consumption of cultural spectacle. As the magazine New York noted late last year, “recessionary gloom aside, New York in 2009 felt looser, freer, more interesting even than it has in recent memory — a littler grittier, perhaps, but more resourceful, too.” The thick malaise of the economic downturn has yet to eclipse the glitz that sustains Gotham’s place in the public imagination. Amidst the strains of unemployment, foreclosures, and the ubiquitous mention of “tightened belts,” the hit song “Empire State of Mind,” by Jay-Z and Alicia Keys, defiantly proclaims, “These streets will make you feel brand new, big lights will inspire you, let’s hear it for New York, New York.” Evoking Billy Joel’s 1976 ode, the song became the city’s unofficial anthem when the New York Yankees won the World Series. As this essay sketches, this kind of celebration of the city’s distinct brand of glamour became interwoven with the palpable gloom of the economic slump and residents’ hope for a recovery that cannot come soon enough. Faced with websites convulsing with denunciations of his act, West cancelled his tour with Lady Gaga, the New York-born pop singer and songwriter who became the first recording artist in history to have four number one hits from a debut album. As a year dominated by dismal recession statistics dragged on, it became difficult to ignore Gaga’s outré fashion, her sexually charged lyrics encapsulated in wildly popular dance-pop songs, and a non-stop creative exercise in cultural bricolage that blended Ziggy Stardust, Marilyn Manson, and Madonna, among others. In a commentary on Gaga’s ascent, Guy Trebay of the New York Times noted, “In a year when retailing flat-lined, when a flailing economy sent creative types scurrying for aesthetic foxholes, when the most indelible fashion image was of a dead man’s sequin glove, a single unlikely figure raised the flag for style and its power to confound, bewitch and amuse.” Consider Gaga’s performance during the Video Music Awards, at which she arrived with Kermit the Frog as her date. She simulated her death during a performance of her hit song “Paparazzi,” suddenly gushing blood as an audible gasp burst from the audience. With such acts, she capitalized on the importance of viral marketing and the centrality of the image in a hypermodern media landscape. Not surprisingly, Gaga was 2009’s most Googled image. For visitors drawn to Gotham’s glamour, the most noticeable recent reconfiguration of public space is probably the so-called “pedestrianization” of Times Square. The closing of several blocks of Broadway to vehicular traffic renewed vigorous debate about the appropriate tone of the iconic space: a Disneyfied attraction for map-toting tourists versus a raw container of what architectural critic Nicolai Ouroussoff described as the “chaotic energy” that offers “the sense of being in a big public room.” Also, the “ruby red staircase” on the northern edge of Times Square (featured prominently in the video for Jay-Z’s “Empire State of Mind”) offers a lively place to sit, people-watch, and gaze at the ever brighter neon advertisements that enclose Gotham’s dazzling “public room.” Other innovative architectural projects were begun before the full brunt of the recession was felt but survived and now offer glimpses of post-gloom New York vistas. 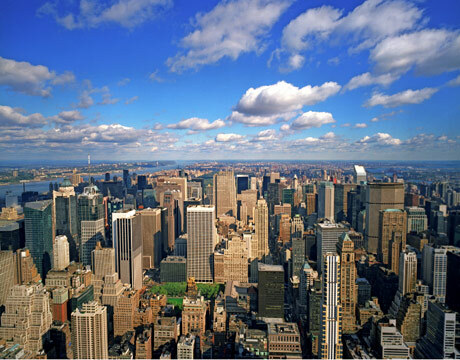 In addition to the ongoing rebuilding of the devastated World Trade Center site, the last two years have witnessed the opening of the limestone masterpiece that is 15 Central Park West on the Upper West Side, the Cooper Union’s New Academic Building in the East Village, and the Meatpacking District’s Standard hotel. The last of these straddles the popular High Line, a once decrepit set of elevated train tracks remade as an innovatively designed, lush public park. In terms of what lies ahead, the celebrated architect Frank Gehry is set to leave a stunning mark on the Lower Manhattan skyline with his 76-story Beekman tower, whose metallic undulations already hint at a reinvigorated city.